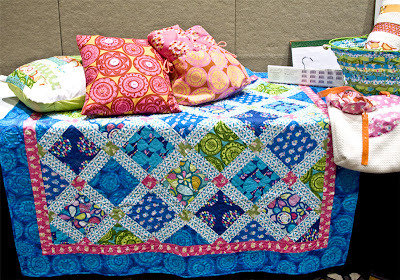 The Fat Quarter Shop is excited to welcome Erin McMorris to the Jolly Jabber. 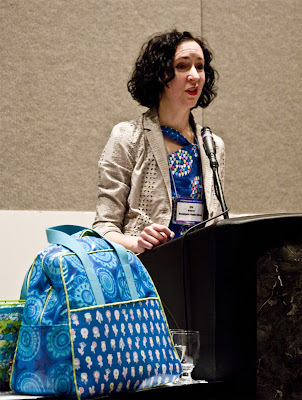 Erin McMorris’ latest fabric collection is Summersault from Free Spirit. Q: What was the first seed that grew into the Summersault collection? A: I thought about Summersault immediately after finishing Weekends and I knew that I wanted to design a collection that was bolder, brighter and a little bit younger than Weekends. I think of Weekends as the perfect spring collection and Summersault as more of a summer collection. As I was designing it, I thought of my happy childhood summers where all the kids were running around outside, playing in the field near our house, or climbing trees in the woods. I was thinking of that feeling of total freedom, fun and imagination! A: The happy raindrops in blue. I usually become obsessed with one color a year and this year it is a deep bright blue which is the background for this print. 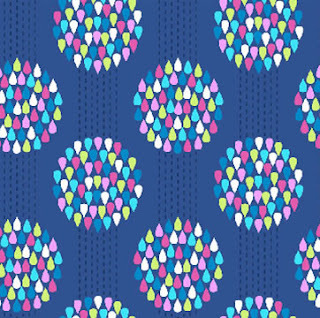 I like this print in all the colorways but the raindrops really pop on this blue. A: Well, I already made one. 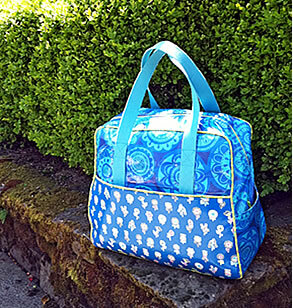 I had been dying to make the Amy Butler weekender bag in laminates, so my friend sewed it up for me using all the substrates from the new collection...the laminates on the outside, the piping in the quilting weight and the inside is a home dec print for more substance. I love it! Now I want 5 more in other combinations of patterns and colors. Anything that makes me jump up and down...I've found it much easier to clean the house when I'm dancing. I just bought the latest DEVO cd...my house has never been so clean. I grew up in Bowling Green, Ohio which is a college town just south of Toledo. And I'm currently living in Portland, Oregon. The bread! There is a reason that sandwiches from bakeries are the best! I had to stop making my own bread because I would eat half the loaf right out of the oven before it would even make it's way to being part of a sandwich. And I love all of bread's cousins, like bagels, muffins, biscuits and scones. I am so hungry right now. Way too hard of a question! But I do have a love of vintage Marimekko prints. My room growing up was bright kelly green, white furniture with Marimekko bedding. I know visually as a child, it made a big impact.